Rabbi Yehoshua Fass, founder of Nefesh B'Nefesh, notes 'magnificent miracle' of Aliyah to kick off first charter flight of summer 2015. 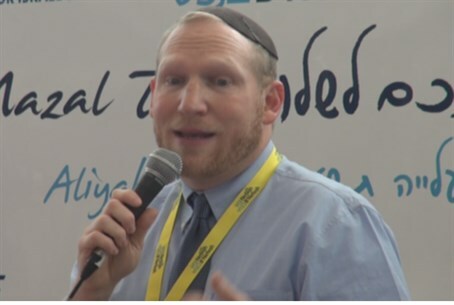 Rabbi Yehoshua Fass, founder and CEO of Nefesh B'Nefesh (NBN), spoke before the first immigration charter flight of summer 2015 on Monday, as some 200 people said goodbye to life in the US from John F. Kennedy (JFK) Airport in New York. Rabbi Fass began by noting how remarkably easy it is for the Jewish people to move to the Jewish state, saying it is "not fair to history" to be able to simply board a plane and land in a new life within less than 24 hours. "Just pause and take in the magnificence of this miracle," he began. "Pause for a moment and realize the gift that we have." Rabbi Fass noted that the immigration process reflects a phrase from the Grace After Meals (Birkat Hamazon), "and they were like dreamers," referring to the prophecy of the Jewish people returning to the Land of Israel. "All of you have dreams and hopes and aspirations of what your lives in Israel will be," he stated. "The greatest blessing you can give to a new oleh (immigrant - ed.) is that your lives in Israel surpass all those hopes, all those dreams, all those goals you have for yourself."